As UH Bikes marks the end of its second bike sharing program cycle in Cleveland this spring, the popular program is marking the milestone with a move to new offices in the Detroit Shoreway’s Antiques District at 7900 Lorain Ave.
University Hospitals first paired with CycleHop in May 2016 to introduce its bike sharing concept to Cleveland as UH Bikes. Today, the company has 29 stations with more than 250 bikes, mostly in University Circle and downtown Cleveland. 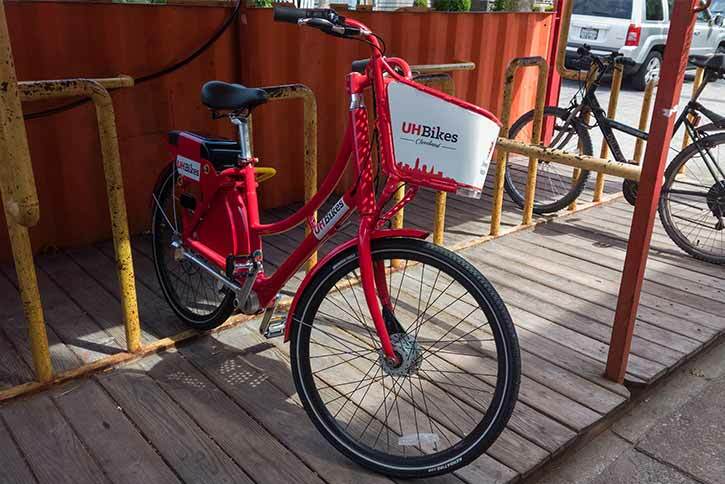 UH Bikes is expected to make the move this Thursday, March 1, into a 2,500-square-foot-space that will primarily be used for offices and bike repairs. The move provides a more permanent space for company, which has been operating out of a warehouse downtown, says CycleHop chief innovation officer John Romero. The space’s owner, Pete Menyhart of Menyhart Plumbing & Heating Supply Co., says he is pleased to have the company as a tenant. “We’re all about improving the neighborhood,” says Menyhart, adding that he poured a concrete ramp off the back door to make it easier to move bicycles in and out of the facility. Menyhart also ran a 90-foot copper line to create a water spigot outside the back door, and he installed a laundry tub to wash the bikes. Romero says CycleHop is definitely considering expansion to its Cleveland service—with an eventual goal of 50 stations and 350 to 500 bikes—but "it’s been accessibility to assets that becomes the deterrent.” In the meantime, CycleHop will work with DSCDC to expand in the neighborhood. “We’ll look at the area,” he says. “Every location has to be vetted, with consensus from the local businesses.” He adds that University Hospitals has been a “tremendous partner” in Cleveland, but they are always looking for additional sponsors at all levels.